A few months ago, I was preparing students for Summer Master Class. I often grab my Ipad and record them, especially if they are so intense on playing that they aren't listening. This is often a problem with all students but becomes even more important as students learn to play as a group. Some of my students were preparing to perform music from Bradley Sowash's, That's Jazz Series. 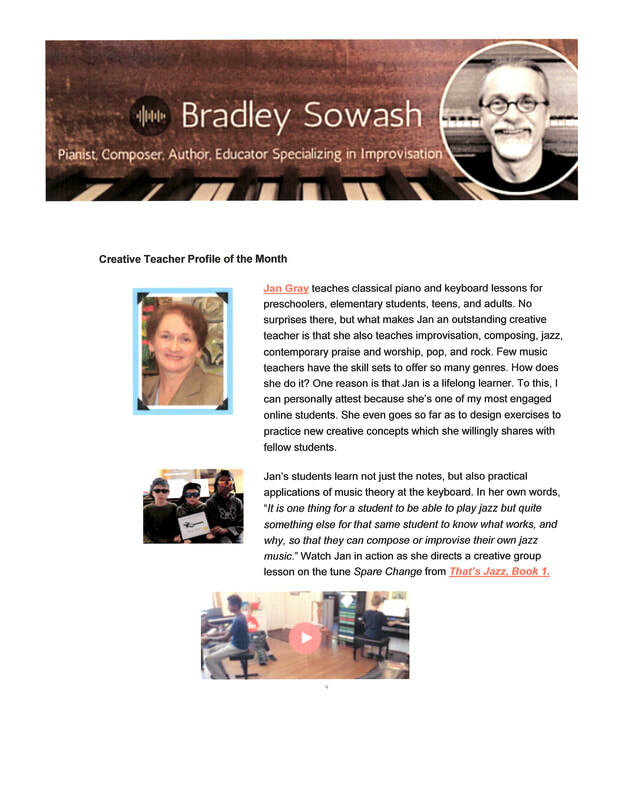 I have been enrolled with Bradley's online group lessons for piano teachers and so (with the parents' permission) I sent the video to Bradley for him to critique my teaching and offer suggestions. This was simply a rehearsal video and we were still deciding parts and was never intended to be seen by anyone but the students who were performing... notice the piano teacher's fingers show up in the recording window.... Bradley offered suggestions for additional creativity and loved the video so much, he asked if he could publish it! Again, with parent's permission... he published it on his U tube channel and it also went out in his world-wide newsletter.